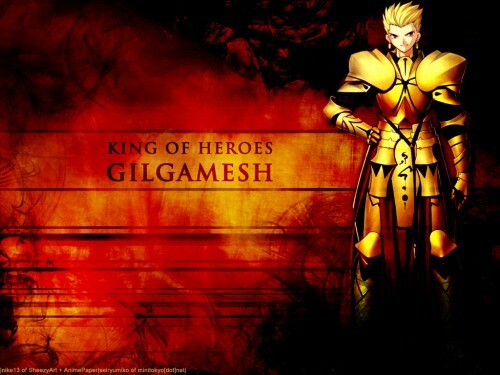 It's about time I got to this wallpaper, I admit to a little procrastinating due to the simple fact that Gilgamesh is a very hard character to find (also didn't originally know which character he was until I finished the series). Hope this is good though, the character was called King of Heroes but he's also a tyranical guy who once he sees something/someone he wants, he will take it/her through force if necessary (preferred probably). Hence the dark, destructive type of background. Oh, thanks thanks thanks ! It's so difficult to find something like that... I had to create my own wall to have him on my computer... and I'm going to believe I'm his only fan. However, thanks a lot ! A character a bit egocentric, but it is not had no reason to be.